That’s the only way to describe this recipe. And it’s very easy! With a substantial green salad it’s easily a full meal. The original recipe called for Red Snapper, but I’ve made it with Orange Roughy, Flounder, and most recently with Talapia. I generally use brown rice, which takes a bit longer to prepare. I use a rice steamer and follow the directions. I start the rice first, and the meal is usually ready to serve when the rice the steamer shuts off about 45 minutes later. Optional: 1 Scotch bonnet, or hot green chili pepper, seeded and diced very fine. I usually use a Serrano Pepper or a couple of Jalapenos, but I’ve also thrown in a Habanero, just for kicks. Just prior to serving stir in 2-3 T chopped cilantro. Rinse, pat dry with paper towels. Brush with 1 T lime juice, mixed with 1 T water. In shallow baking dish, bake uncovered in 450° oven until fish flakes easily when tested with a fork. Allow 4-6 minutes for each 1/2″ of thickness. Garnish with lime slices and cilantro. 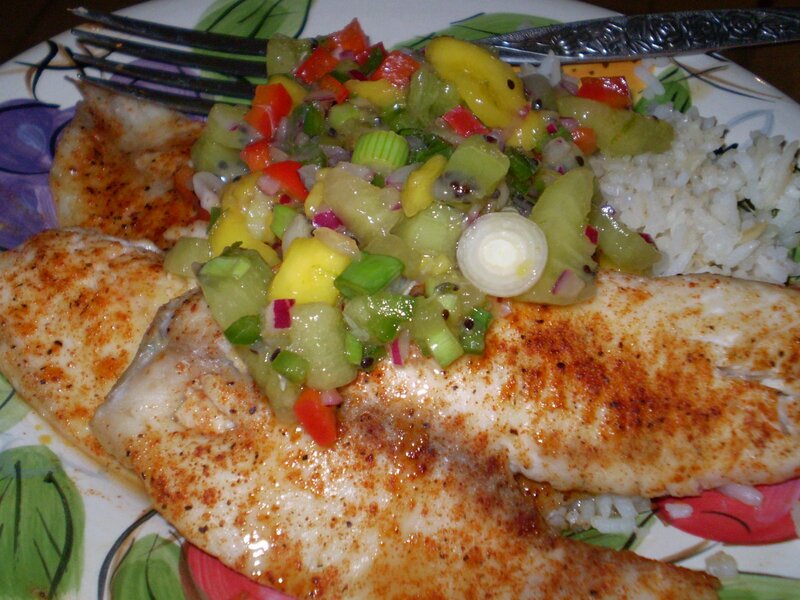 To pull it all together, start with a pile of rice, add fish to the side and top it all with the mango salsa. Garnish with lime slices and cilantro. IF there are leftovers I put it all together in a plastic container. Usually the fish is gone, but there might be rice and mango salsa left over. I’ll eat the leftovers as a light snack within a day or so. *After I realized how much I like this I made this Spicy Fish Rub in bulk and I keep it in a shaker bottle with my herbs and spices. It’s always handy to sprinkle on fish to use in this recipe.